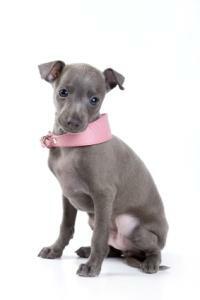 Dog collars come in two basic categories: training collars and fashion dog collars. Sometimes the two types of collars are combined to create a functional, but fashionable dog collar. Fashion dog collars come in a variety of materials and styles. You may even be able to find matching leads to coordinate just the right look for your trend-conscious pup. Collars are not just for obedience class these days, they are the critical item you must have to hang your dog's identification tags and bling from. As dogs' lives have changed, the selection of dog care accoutrements has expanded as well. People spend a great deal of time with their dogs, and, in turn, a great deal of money as well. As more dogs spend time indoors and traveling with their people, the demand for fashionable dog supplies has increased and trendy dog collars are among the most popular canine fashion statements. Whether your dog is a toy poodle or an English Mastiff, you will be able to find a fashionable dog collar that fits your dog's personal style. You can find collars and other great fashion items at canine boutiques, online stores and local pet supply retailers. Designer fashion collars for the haute dog are in abundance; many popular designers have a line of high fashion items for your dog. The Big Dog Boutique is an online store that carries fashionable collars for giant breed dogs like Mastiffs and St. Bernards. If you are having a difficult time finding a cool collar for your gentle giant, take a look at their website for a great selection of collars and other products made with big dogs in mind. Baxterboo features a variety of fashionable options ranging from a black satin bow tie to a collar with cat eye cabochons. PupPanache offers abstract and funky options like the bright summer personalized collars. If you are creative and able to sew a little, you might consider making a custom fashion statement for your dog. You may either buy a kit, or you might want to follow the instructions for making your own dog collars given at Instructables. This is a blog written by Amanda Tikkanen, who writes about her Catahoulas and offers some great ideas for making your own useful dog items. Once you have made or purchased a basic nylon collar, you can embellish it with buttons, fabric shapes, beads, or other decorative materials to make a truly unique collar for your dog. If you enjoy this, you can go on to make a matching lead and travel bag. Dog fashion is fun, and anything goes! Whether you are headed to Rodeo Drive in Hollywood or the Rodeo in Brownwood, you can enjoy enhancing that special pup's appearance with a fashionable collar.